Gyroscope with a rainbow, or Pepsi ad? 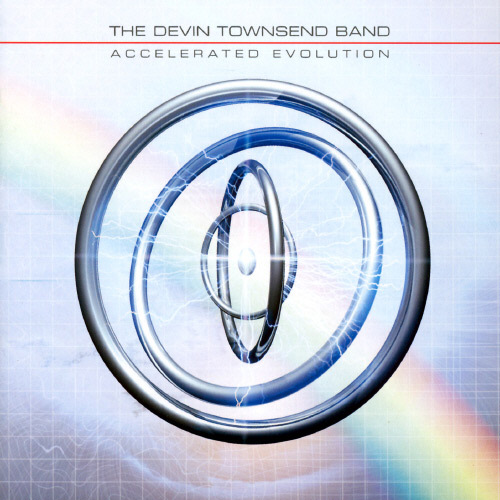 Accelerated Evolution was the first album to be released under the banner of The Devin Townsend Band. Rather than marking a mere cosmetic change, however, in comparison with its immediate predecessor Terria, this album does sound much more like the work of a full band. Part of this is likely the result of adding a second guitar player, which gives the songs a thicker feeling even when Devin is noodling around. A large portion of the change, though, stems from the songwriting itself, which has produced an album chock full of much more classic song structures and gestures. This type of more basic songwriting technique can often restrict an artist’s vision, but Townsend’s music seems equally adept at expressing itself through avant-garde and more open, textural compositions as through this mode of straightforward verse-chorus songs. Thus, Accelerated Evolution is unmatched in Devin’s “solo” catalogue for its straight-ahead, absolutely gorgeous pop catchiness (or, at least, was unmatched until last year’s jaw-droppingly brilliant Addicted – more on which at some future date). “Storm” features some of Devin’s most beautiful, heavily emotive vocals. Plus, make sure you pay attention about a minute from the end of the song, where you will hear what is probably the highest note we have yet to hear Mr. Townsend emit. It is truly a thing of agonized beauty. The references to rain throughout “Deadhead” evoke Devin’s earlier Ocean Machine project, as does the song’s atmospheric spaciousness, while “Suicide” boasts another ridiculously catchy chorus (although I’m still unclear as to what exactly an “internal suicide” is) AND probably the closest thing to a breakdown the man has ever produced. “Traveller” is essentially a perfect pop song, which just happens to be disguised as an awesome heavy metal sing-a-long. “Away,” on the other hand, is an extremely melancholy, primarily instrumental piece, whose sound hearkens back to the wide-open ambience of Terria and Ocean Machine – Biomech. Where that ambience grew a bit tiresome on Terria because there was little to break it up, in this context if functions quite effectively as a palate cleanser and point of reflection between the harder-driving, insane catchiness of the rest of the album. Its closing section also features some wonderful melodic improvisation while the rest of the band floats along in a chilled atmosphere. I find that toward the end of the album, the songs become slightly less differentiable, so that by the time “Slow Me Down” has finished, I feel quite certain that I’ve just listened to an album of fantastically catchy metal/pop gems, but I can’t necessarily recall them all to mind. “Storm” and “Deadhead” are definite highlights, though “Depth Charge,” “Suicide,” and “Traveller” are just as likely to worm their way deep into my subconscious. When the dust settles, the most non-hyperbolic way I can describe the appeal of Devin Townsend’s music is that he strikes a wonderful balance between balls-out heavy metal insanity, instrumental wizardry, and a deft classicism of heartstring-tugging melody. Accelerated Evolution finds Devin in fine form, gathering up the wayfaring excess from previous outings and compressing it into judiciously apportioned anthems; to extend the metaphor, Accelerated Evolution is the ultra-dense black hole to Terria’s vast, hypnotic nebula. Few artists could claim credibly the term ‘evolution’ for an album which exhibits pure retrenchment into classic rock song structures and irony-free melodic emoting. Devin Townsend, mercifully, is one of those blessed few, and Accelerated Evolution is a tremendous album. Note: If you can track it down for a non-exorbitant price, I would definitely recommend picking up the limited edition 2-disc version of Accelerated Evolution, which attaches a bonus disc featuring three tracks entitled “Project EKO.” These are full-on ambient/electronica excursions, all smooth and mellow, but thankfully without falling pretty to the frequent pitfall of ambient music; namely, that it is so ‘nice’ and ‘inoffensive’ that it immediately fades to the background. The songs have electronic beats rather than just pleasantly drifting tones, and contain enough movement and variation to remain interesting. “Locate” sounds like a less dub-influenced version of The Orb’s first few records, an impression which “Echo” intensifies with its heavy use of spoken-word samples. “Assignable” is even more upbeat, with some clanging guitar echoes laid atop the energetic techno beat. All in all, these three pieces are a nice come-down from the metallic heft of the main album, and should appeal somewhat to anyone with an interest in the very early styles of IDM (especially late 1980s British techno, and early Warp Records artists), but certainly will not appeal to all fans of Devin’s more metallic endeavors.